I’m writing this in my final few hours in Dahab, once more struggling with the idea of leaving this amazing town. The wind is softening the heat of the sun today, and I’m just sitting by the pool, hearing my last call-to-prayer (I think) and mentally preparing for the trip back to Sharm El Sheikh airport. Whenever I say I’m coming here people say to me, “ooh isn’t it dangerous?” No. No, it really isn’t. I’m pretty sure it’s more dangerous living in London, where only recently someone got shot on a road near to mine, and various members of ISIS in Syria have been recruited from a local school. To get to Dahab you have to get a taxi from Sharm airport and drive for about an hour through the mountains on quiet roads. There are two police checkpoints on the way, and depending if your driver is friends with them or not (or well known) then you simply pass through after the usual Arabic pleasantries. Given that the queue for passport control is about a tenth as busy as at a London airport, I’m fine with this. At one point, you had to join a convoy of cars to drive through the checkpoints, now this is not the case. Southern Sinai is perhaps the most security conscious of all the Egyptian governorates because it houses the all-important tourist industry. Hence the police presence. ISIS are active in one tiny corner of this 1 million-square-km country, in the northernmost part of Sinai, bordering Israel. Whenever I mention this to a local friend, they express surprise that it’s even a consideration to tourists given that it is so far away. I’ve written a lot already about how scared I was of everything here, and how those fears have eroded over time. I now know that I am incredibly safe here, from walking alone in the dark, to leaving valuables lying around in a cafe or by the beach. People respect my person and my belongings and I know that they would drop everything to help if I found myself in a ‘situation’. It’s all too easy to translate the shopfront ‘hassle’ as something more insidious, as I did previously when I had a panic attack inside one, but it’s just the way things work here. 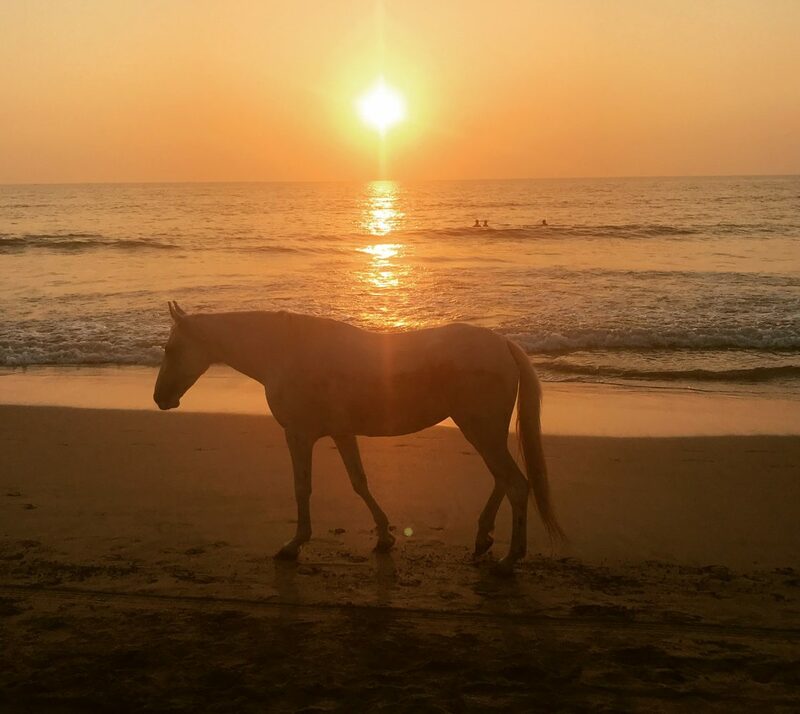 However, even the locals are learning that the less they hassle, the more likely it is they’ll get tourists to come in to their businesses. Now I’ve just got to adjust to the culture of nothing quite being what you think it’s going to be. This applies to the timing of things, the cost of things, and what you expect things (like day trips) to be. At first you think you’re being taken for a ride, but you soon realise that this is just the way things are here. Nothing is quite what it seems at first, but that doesn’t necessarily mean that’s a bad thing. In fact, it’s often an improvement, if you let yourself go with it. You can save yourself a whole lot of bother if you just adopt the local, ‘what can you do?’ shrug and get on with it. So once again I’m leaving here knowing full well that I’ll be back. The only fear is that something will prevent me, but I somehow know I’ll find a way to return to this magical place. 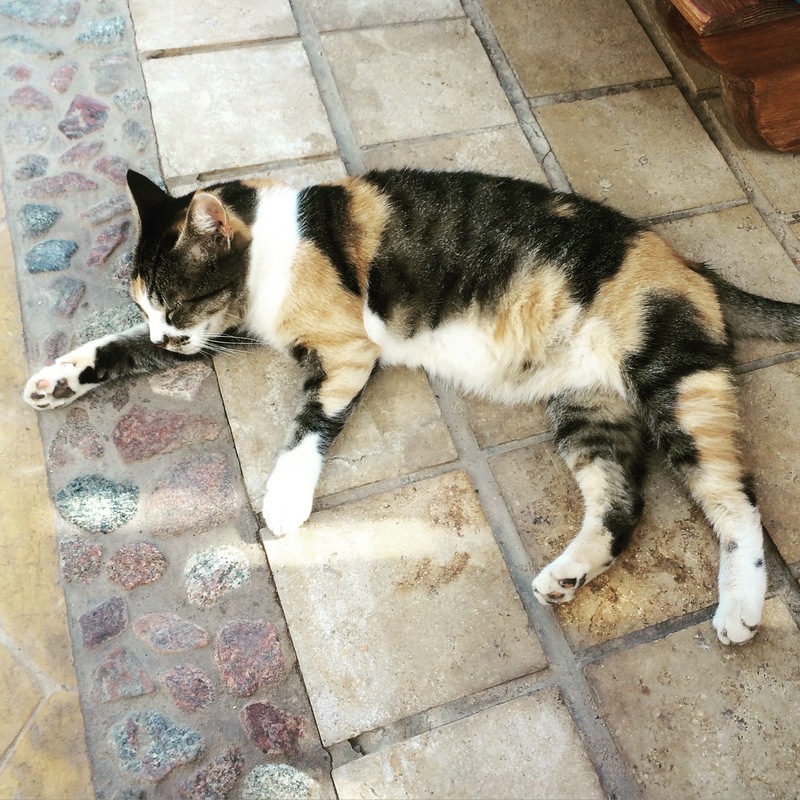 I’m stopping now because a cat wants to climb on my keyboard… See you on the other side. I’m writing this on the other side, filled with horror and sadness at the news about the Russian Metrojet plane crash. Not only for the deaths of innocent people and the grief of their families, but also for my friends in Dahab who rely on tourism for their livelihoods. As they say, I hope all will be ok, inshallah. The other night two Egyptian football teams were playing each other. I found this out after hearing intermittent roars echoing around the hotel before I left to walk into town. It was probably the best walk past all the shops I’ve ever had, in that no one was interested in selling anything to me – they were all crowded around a series of tiny television sets on the street and punching the air with glee. After a frustrating night trying to find a restaurant with wifi, we ended up on the roof terrace of Jasmine, lounging on cushions, listening to the soft crash of the waves and looking at the stars. Santana’s Oye Como Va came on the sound system. What a perfect soundtrack to this hippy heaven, I thought. The restaurant manager said Carlos Santana was his all-time favourite musician. Can’t argue with his choice. Yesterday I thought I’d have a lazy day by the hotel pool, just reading and chilling out. At around 10.30am the sound of one voice singing started coming from a mosque near the hotel. It was quickly joined by another from a different mosque. It was so beautiful, and I did try and Periscope it, but the wifi wasn’t enough for the app to register the sound. After a while the singing turned to impassioned declarations, then singing again before it stopped at midday. I was later told that this happens every Friday. This is the equivalent of Sunday morning church bells – every Muslim should attend the mosque, if they can, and they are excused from work to do so if they need to. I began to think about all the sounds of Dahab and how I love all of them. The music, calls to prayer, the dogs barking at each other, the crash of the sea at night, the cat fights, the sound of the wind in the flames of a fire in the desert, the friendly shouts between Dahabeyans (if that’s the word for them), even the fake bird tweets in restaurants that signify a dish to be picked up from the kitchen. And then there’s the silence of the mountains. 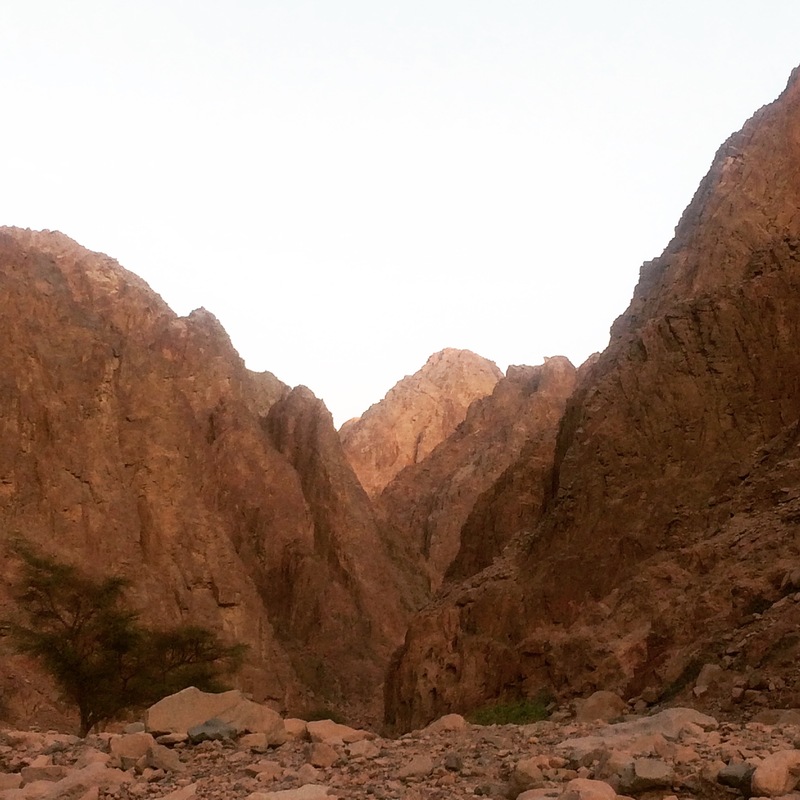 I visited Wadi Qunai in the evening with a Bedouin guide and once the air-conditioning in the 4×4 had switched off, there was a profound presence in the air. I realised that the silence was almost a sound in itself. I could hear the buzz of my own circulating blood in my ears just above it. It wasn’t until it turned dark that the desert black beetle started up its peeping, joined by others round the canyon. We drew our cushions up on our rug and lay down to look at the stars. I could see the Milky Way, and track satellites passing across it on the same orbit. 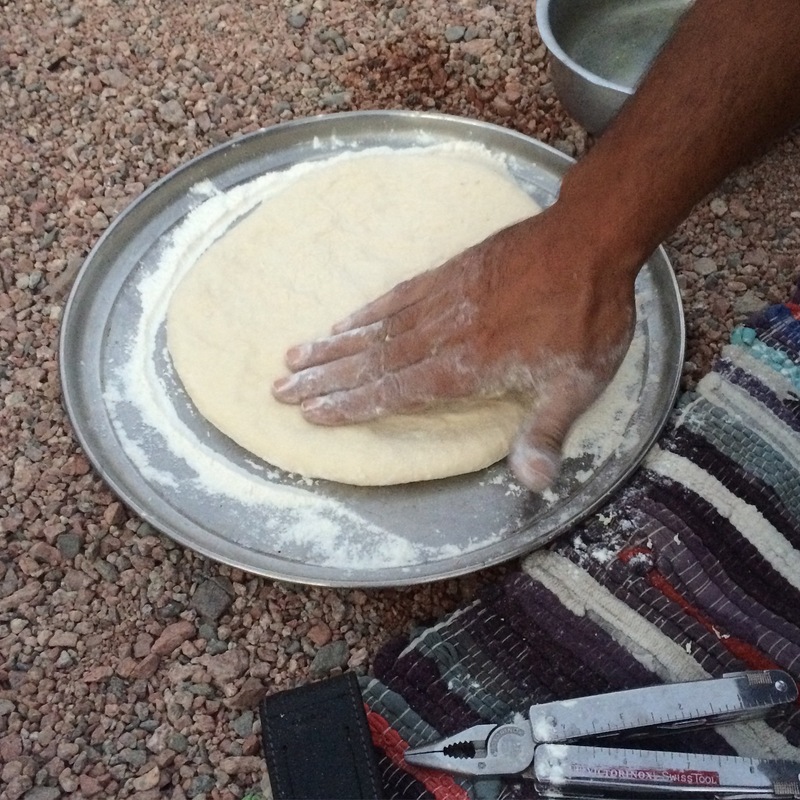 Before this, our Bedouin guide had made bread for us, the traditional way. He had been taught how to do it by his father, who still lives in the mountains, and when I asked if he’d taught his sons the same method, he said that they were too interested in their phones… This sounds familiar. First, he put a handful of salt in a bowl, added water, and swished it around until the salt was dissolved. 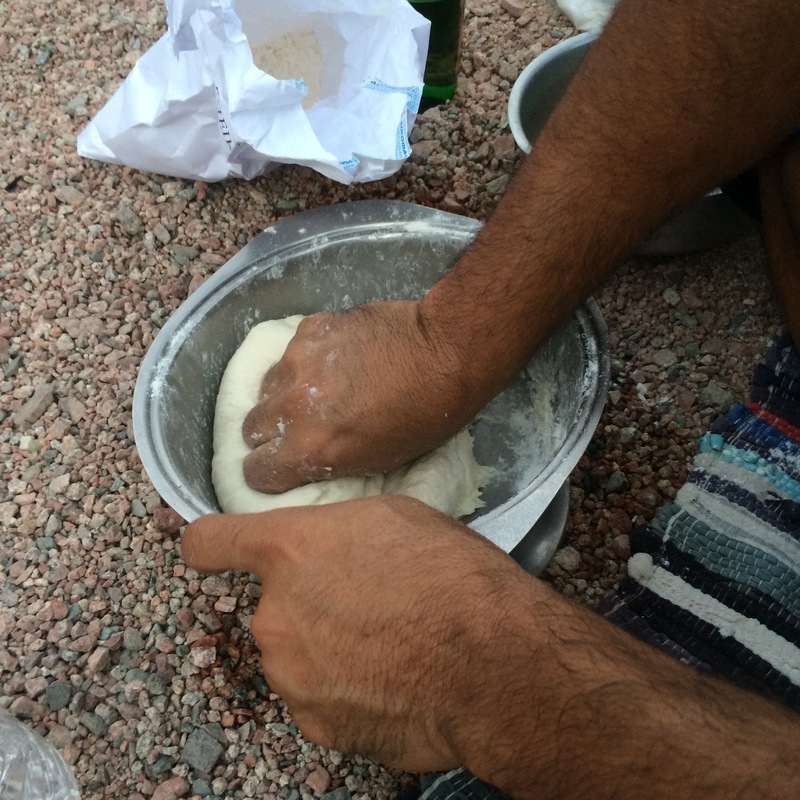 Then he added flour – a special one for baking in sand, apparently – and began to knead. The Great Bedouin Bake Off begins. Once the dough was in a soft, but tight ball, he flattened it out on a tray. The fire he’d built had calmed down to glowing coals, which were slowly sifted until he’d moved the top layer away. 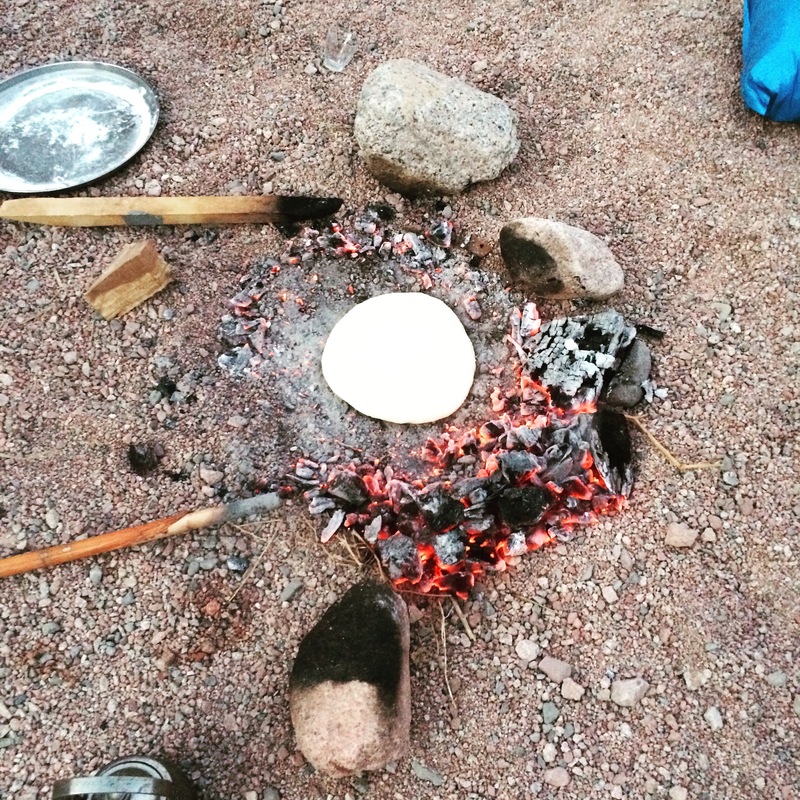 Then the bread was placed on top and covered over with coals using a stick. After about ten minutes, the coals were removed, and the loaf scraped, wiped and banged to remove any traces of sand or gravel from it. 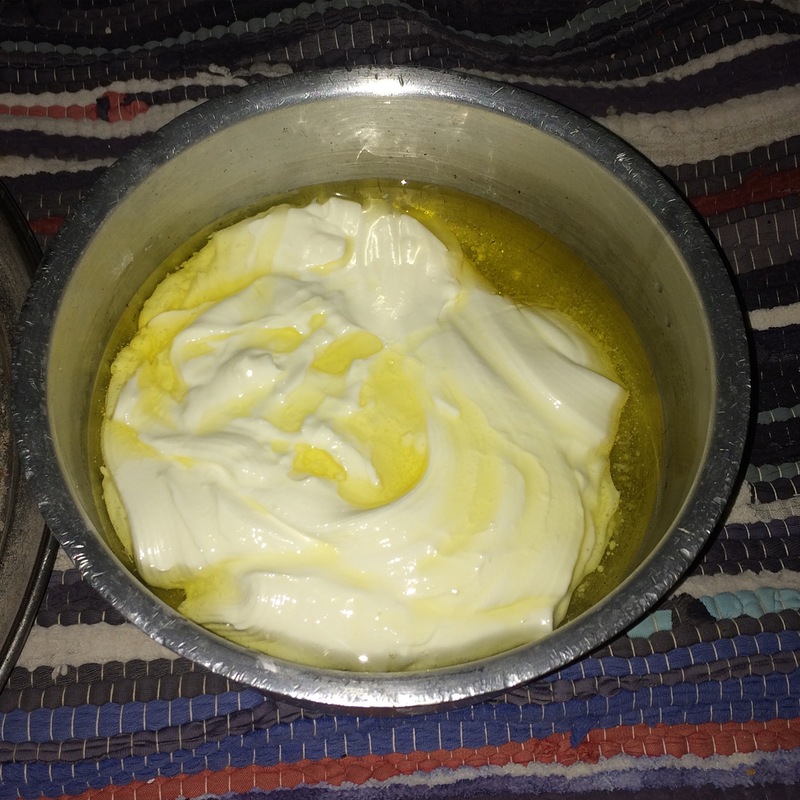 He cut the bread into pieces and we dipped it in soft feta drowned in olive oil. He showed us how to slurp sweet tea with the mixture still in our mouths. 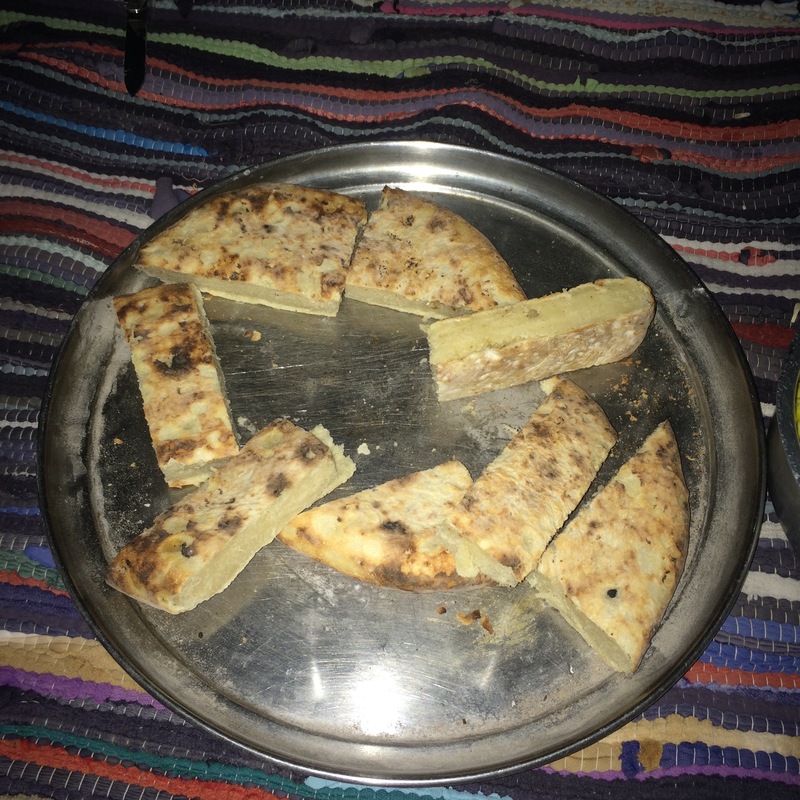 The combination of this sweetness, with the salty, chargrilled bread, and the savouriness of the cheese tasted like the best pizza I’ve ever had. Eating it below the stars was an added bonus. That seems to be a pretty good mantra to me.